Isn’t it cute when a columnist, one that absolutely doesn’t live in his mom’s basement (like a lowly blogger does) and fling poo at the walls to see what sticks, writes about something of which he knows nothing? You know, a columnist that has spent numerous words and time just asking if a certain coach should be fired and just why he might think that coach should be fired? Only to write a complimentary piece about the man who eventually did what said columnist suggested. Congratulations Mr. Bradley! Mrs. McGarity just highlighted your name for the Christmas card list! Let us not forget that Mr. McGarity actually spent more time talking to his ol’ buddy Mark last year than he did Mike Bobo. As a result, Bobo left his alma mater for a head coaching gig (not a big problem) feeling as though his services were not appreciated (big problem). Especially when the Athletic Director turned right around and gave Richt the money Bobo so richly deserved to one Brian Schottenheimer. As the kids say, “YGTBFKM.” Some other facts as well as suggested conclusions as I see them. Yes, McGarity has lied. Part of his job is protecting certain information to make sure the University and Athletic Dept. he represents are cast in a favorable light. But he looked bad doing it. There was no PR savviness involved in anything he said. At all. No leadership qualities. 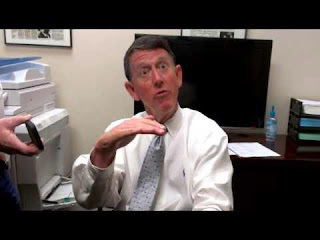 I figure Greg McGarity to be someone who delegates. I guess the associate who typically handles Monday press conferences called in sick that day. Too bad. One of the biggest issues was the search firm he hired. As Schlabach suggested, it’s name is Google. But follow the timeline, and bear with me because this gets complicated: on Monday about 10am McGarity says there will be a full search and vetting of candidates...then, on Tuesday about 9pm news leaks that Kirby Smart is not only indeed the choice, but has agreed to terms...probably. That’s a doozie. What it says to me is McGarity talked out of a side of his mouth the boo$ters hadn’t approved of yet. I think the AJC’s breaking of the story came from persons close to the program and not necessarily employed by it. And really, that’s just another incongruence between our AD and the guys writing the checks. I do absolutely believe McGarity would prefer an exhaustive interview and vetting process for the biggest hire of his tenure. But I believe the boo$ters had decided after the Florida game that change needed to come. It’s been awhile since Georgia has fired a coach, but I remember how things move along once the coach has lost the money players. Meanwhile, Richt’s name gets (albeit loosely at the moment) tied to the Miami opening that came in the days before the WLOCP, and South Carolina’s search is hitting a full stride. At some point Kirby Smart, the guy at the top of many influential persons’ lists (probably including McGarity) evolves into Ray Tanner’s chief target. I think this coincides with Tom Herman slowing his roll a bit as he was the hot name out there. So the plan is in place to force Richt out and bring Smart in. The problem was Richt didn’t lose another game after Florida like many expected (maybe even hoped…??) and the fanbase was more than a little surprised Sunday when the ax fell. Couple that with the timing between the “mutual parting of ways” announcement and the “team meeting with Butts-Mehre bouncers” and suddenly there’s a firestorm of malice and a potential PR nightmare. Luckily, a press conference is scheduled for the next day. The press can ask Richt some questions and then at a later time after Richt has driven his Ford F-150 into the sunset, McGarity can have his turn when it will be easy to deflect questions and focus on the task at hand of finding a successor. All he’ll need is a hot mic and some band-aids to re-assure the masses (which by this time are local, regional, and national) that this is a minor flesh wound and everything is going to be okay. But oh no! It’s a joint press conference!! Richt, already the besmirched hero, is right beside McGarity whose only friend at this point is Mark Bradley. Richt doesn’t even break a sweat saying goodbye. Meanwhile, McGarity leaves behind a pool of Clairol for Men in his seat. Band-aids don’t equate to a tourniquet. Compounding matters is the apparent back and forth over autonomy as it relates to the new staff after UGA just got rid of the last coach in America without such a luxury. Even if these were just rumors, they come during a week when rumors are a dime a dozen. Like when a blowtorch enters a gas station, things get heated. You can decide which (if any) of those ten points you believe, and then proceed with your online betting. I mention them all to illustrate that as we near the beginning of the Kirby Smart era, it appears that at a minimum there is a divide between the administration and the fanbase. And while that can be repaired, there may also be a divide between the athletic director and the power brokers. That one is a slippery slope filled with potholes and barbed wire. As the Smart “news” was “breaking” Tuesday night, I received a text from a buddy mentioning the rumor that there’s a push to make Frank Ros (1980 captain and recently retired Coca-Cola VP) the new UGA Athletic Director. Since then I’ve read it in two other places. Doesn’t mean it’s any more true or that McGarity’s job security is actually in hot water. What it does mean is that the guy could use a better week to follow up his worst; a week in which he has more than one friend.